Back by popular demand! It’s the Barbara Gerwit tote bag! Done in some of our best selling Summer Coordinate prints, these tote bags are a fun pop of color and print. Our tote bags are playfully designed with exciting prints and eye catching color combinations. They vary from a tropical and tranquil coral reef motif, to a trendy and chic ikat print. Oceanic blues, kelly greens, and pops of pinks and oranges are just some of the enticing colors that these comfy totes come in. It’s the perfect accessory for those fun days at the beach, or even just a stroll down the boulevard in the tropics. 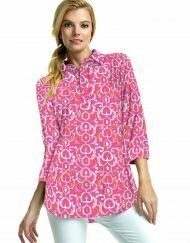 They also go along perfectly with any of our other Barbara Gerwit tunics or dresses. Made out of a soft yet sturdy cotton canvas, these bags are spacious enough to fit all of your beach essentials inside, plus more! Our tote bags come with a zipper pocket sewn into the lining for holding all of your cards, maps or ID, and also includes closure straps to secure everything safely inside. These tote bags are simply a must have.